This is a vintage style camera adorned with an authentic Swarovski Crystal Element Rhinestone or a white pearl, your choice! The charm is Tibetan silver and has a slightly worn vintage look to its surface. 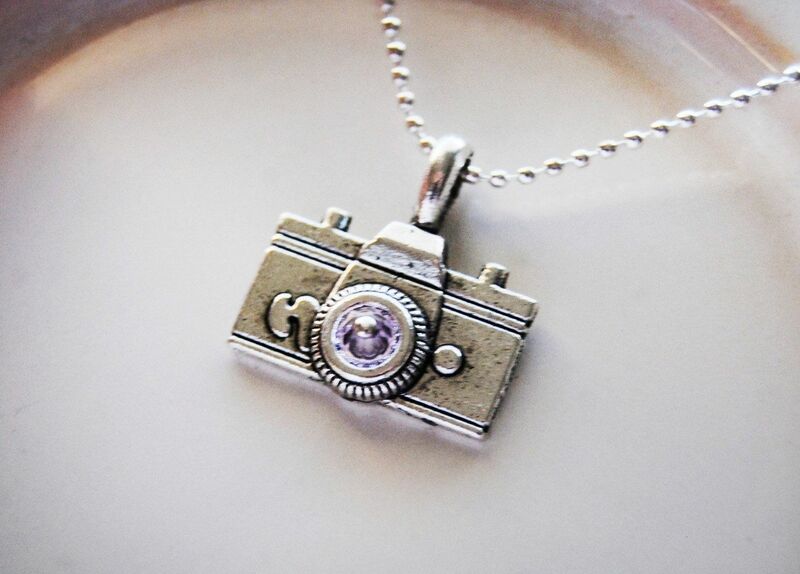 Camera pendant hung on a silver plated ball chain necklace and is made of lead free silver plated zinc alloy. Reverse side is flat and textured to match the front of the charm. This necklace would be great as a gift for the photographer or photo enthusiast in your life! Approx. size of the camera is 1" X 1.5" (with the bail approx 1.5" X 1.5"). This necklace come complete with organza sachet for ready to give gift and your choice of colored swarovski crystals or pearl. Ball Chain is included in the listing. *Your choise of 16 inch, 18 inch or 20 inch ball chain necklace. Turnaround time after the photos are received to complete the order is 2 days even if most of the times the order is completed and shipped the very next day.